Thanks to Vicente Gómez, we return to talk about the post-ICU síndrome (PICS) after an article published in MEDPAGETODAY. Maurene Harvey is a nurse, and she was the first nurse to be the President of the American Society of Critical Care Medicine (SCCM) in 2002. My thought is always the same: why we have two societies in Spain, one for physician and another for intensive nursing?. Recently we shared an excellent article by Maurene and she returned to speak about this item at the recent Congress of the SCCM. She keeps making visible the invisible. 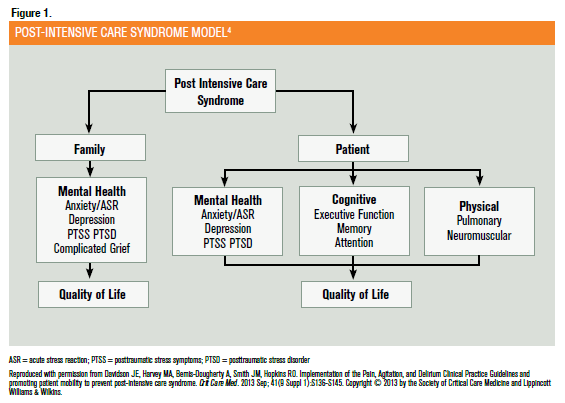 To reduce the number of patients with post-ICU syndrome and raise awareness of its consequences is a priority of the SCCM THRIVE initiatives. 3 of every 4 patients receiving mechanical ventilation have difficulties with daily activities a year later, and 95% having ICU-acquired weakness continue to have problems related to their hospital stay from 2 to 5 years later. Therefore, ICU patients need a specific follow-up for their recovery, and this begins to make in many countries. Harvey remembers us four strategies that are being implemented in the United States, but still with little researchs. 1. Working to reduce the total number of days patients remain on mechanical ventilation and in the ICU. On the other hand, the early psychological intervention also has impact on the incidence of post-traumatic stress syndrome: counselling, stress management and coping skills have proved to be useful to reduce its appearance. Even simple interventions during an ICU stay, such as promoting quality sleep, decreasing noise, adjusting room temperature, and making sure patients have access to glasses and hearing aids, may have an impact on PICS. “Now that we know PICS exists, we can not do nothing”. And you can do in your CI-HU?